After this picture was taken, I finished Part 1! I'm only two months behind. It looks really pretty, and the pictures don't do the copper metallic braid justice. I won't be doing the beads until the end because of the Q-Snap situation, but I'm pleased with the effect so far. Part 2, I've heard, is a lot of work, and it looks like it. At least I've already started. All the edges are now neatly trimmed up and the strap is 28.5 inches long. After this picture, I sewed up one side of the bag and was surprised by how nice it looked. Strangely enough, I'm beginning to feel I'm nearing the end of this project despite the large amount of beading around the edges and the rest of the beading for the rose to go. Perhaps my feeling is right, though. I'm getting through. I managed, today, to stitch the rest of the outer pink color of the heart. Still have to add the darker lines, but at this rate I -should- have this done next week. Maybe even by the end of this week. I needed a quick little project to complete and will put another short one in my rotation when I finish this one. I'm still thinking of finishing this one as an ornament, although I might put it as the top of one of those spiffy Lifesavers Sours metal boxes. Well, I got more blue and gold done on the corner. If you want to see other colors in this part, you're out of luck. It's all blues and golds. Luckily for me, I like the combination. The very corner part somewhat mirrors the four corners already done earlier in part three. I'll be working on part five for months, I think. I got one pot done, at least. They're coming along and it's a lot easier to do than the arches. Once I'm done with the pots, there are a lot of Rhodes stitches to put into different areas. Maybe I'm over the slump I was feeling about this. I can hope so - I'd like to finish this some time in the next year. Several weeks ago, Yveline wrote to me and asked me to get some extra Waterlilies for her in the color I sent her for Christmas. It took quite a while because I used Stitching Bits and Bobs, but I sent them to her last month. Last Saturday, I received these two things in the mail from her as a thank you. The hexagon is a needle case, and I'm sure I'll put it to work. The white square is an exquisite piece of hardanger - the second piece of hardanger I've ever owned. I LOVE it. Yveline won't read this, though ... she only speaks French and is part of the round robin group I belong to. I'm writing her a separate thank you and hope to get to see her and some of the others when I go to France in just under two months. I got the mystery Huswif's first two bands done. The next band is some upside down letters and I'll at least start that next week. Even though these colors aren't really what I like, it's growing on me some. At least it's not pastel! That's the problem with mysteries, though - you never know the colorways. This one could definitely be worse. I got the inside of the bell shaped flower done this week and will be outlining it with Jaceron in the coming on. I'm SO glad I started this after I did the other goldwork project. It gave me half a clue as to how to go about things. It's getting lots of attention from the family whenever I pull it out. I got all the cross stitches done on Part 1 and the Rhodes stitches have been done since this picture on Friday night. In fact, I got a lot of the backstitching done yesterday, too. So I -should- have Part 1 completely done by the end of the week. I still think this fabric is perfect for the pattern, and I really like seeing it come to life. The roses are getting there. They seem to be a bit more orange than I wanted, but I'm not about to go rip everything out now and start over. It's over halfway done for sure now, and I got more done after this shot was taken. Perhaps I'll get some time tomorrow to work on it. This week, I managed to get to the point of turning the purse layers right side out. Since taking these pictures, I sewed up the open side and mended the little areas that didn't quite get caught into the hem properly. Now to sew up the edges and make it into a real purse before beading it some more... I should get it done before going to ANG seminar in August, right? I do like the color of the lining, even if I don't like sewing it. It's slippery. I got the plant in the basket at the top done this week. Since the taking of this picture on Friday, I finished the balls on top of the columns and started the pots at the bottom of the piece. It's getting there, and I'm so glad I'm done with those arches finally. Perhaps I'll get some of the pots done this week, too. New project! My husband took the picture upside down, but he didn't know. It's the first picture he's taken of it. I actually paid for this back in November and got the first installment in February. It's the 2007 Mystery from Carol Tinson of Heirloom Embroideries. It's a huswif, something I've never done before. The silks are from Vicki Clayton and they're very smooth and wonderful to work with. I got some more done on this yesterday, so you'll see more in the picture next week. Of course, I have no hope of catching up to everyone else... but I'm used to that by now. Still working on the first corner of Part five. Since there are four of them, this is going to take quite a while, but I'm still working along on it. Hopefully, with less running kids about and more time this week, I'll get some done. The top picture is the one taken at the time of all the other pictures last night, and the bottom one is from this morning, with it complete. I had to stay up late waiting for company to get here through the snow, so I put the time to good use. I like the looks of it and will be turning it into a little cushion for the friend who got here late last night. This also makes finish number seven of my ten project challenge and I get to start something else. Yay! I do finish things sometimes. Yay! I got Part B, the second leaf, done today. They look pretty good together. Now, if only I could find more time for this. I really need to get it done before I go to France, as I don't want to have to carry it in my suitcase over there and risk something happening to it. On to Part C, the inner part of the flower. I got great news today when I opened my mail. The Embroiderers' Guild of America has awarded me a Legacy scholarship to make an English language guide to the Lace Route of Normandy. I will be going to that area in late May and staying until the beginning of July. I was looking forward to this trip before, but I'm really excited now! A few months ago, I finished this blackwork piece called Albemarle. My husband finished framing it tonight and took this picture. He picks out all the mat colors and makes the frames himself for all my projects now. Unfortunately, he's been traveling a lot and the garage has been too cold to work in, so this is the first he's finished in a bit. During the weekends he's home before we go to France, he'll hopefully get a few more done. Anyway, doesn't it look great? I'm -almost- done with Part 1's cross stitch. Just two more colors on the bottom point, and then the backstitching and special stitches. As I use Q-Snaps, I'm not going to do any beading until the end. I still like the looks of this ... and I really like it more on this fabric. Still plugging away on this, but as you can see, I have one of the roses almost completely done. The colors seem to mesh with the rose directly above it better than the other two, but I think it'll all come together. Now to get cracking on stitching! At least this is a project I can take places, like the orthodontist's waiting room. The strap is now 25.5 inches long. I've not been able to stitch as much as I usually do this month due to some complications in my life, including company or going out every weekend, a traveling husband, and a son who's made a really really stupid decision. Oh, and my obligations to the groups I volunteer for. So this has been languishing a bit along with my other projects. I got a bit more stitched on the strap and the lining, but this is one project that just won't travel, so it never gets taken with. Maybe next week ... this week has become as busy as every other lately. I finally started Part 5! It's a rather large part, having a huge area in each corner. It's all turquoises and golds, so it's going to look really pretty, though. I'm just happy to finally be on another part. Sure there are seven more after this, but it's better than eight! Slowly but surely that mini mandala is getting done. Lots of backstitching on it lately, and I'm really just about done on the middle. Got all the cross stitching completed. Rhodes and more Rhodes to go, though, then the beads. I think it looks pretty, but it doesn't look like the picture in Gift of Stitching. That one didn't have a model stitched for it and there really wasn't an explanation as to whether things were Rhodes or Algerian eye stitches. It also had a really bad way of showing the backstitches. Who knows if, in the end, I'm making it the way Martina designed it? On the Midi, I got the ball and plant in the upper basket done and am now working on the basket itself. Once that basket's done, there are the balls on the tops of the columns and then a whole line of plants in pots at the bottom. At least it's not those arches! As my husband commented on my last posting regarding the goldwork, gold is not normally my favorite metal. I'm far more partial to silver and bronze, and will, eventually, do goldwork in both those colors. For now, I'm enjoying learning the technique and I think the gold looks good for the two things I'm working or have worked on. This week I got the lattice done on the second leaf and will hopefully complete it in the coming week. I still like how it's coming together, even though some of the lines on this second leaf aren't quite parallel. The round robin is coming along - one of the roses is nearly complete. I think it'll look good with the others when it's done. 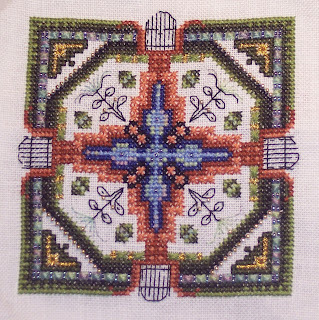 Now to get it done in the next couple of weeks ... On the Medieval Mandala, I got the insides of the fences backstitched this week and two of the four outlined in black. Since this picture was taken on Thursday, I completed Part 4 (yay!) and started Part 5. Part 5's going to take a while - the four corners of the area are all filled in with a lot of blue and gold. It'll be pretty, though. I'm just really happy to be done with Part 4. The mini is still coming along. As you can see, I've been doing a lot of Rhodes stitches and backstitching on it. Pretty much half the backstitching is done, and there are fewer than that Rhodes stitches to do. Once both of those are done, I'm going to take a day and do the beading on it. Then it'll be done. On the Midi, you can see that I've managed to start another color than the arches! I'm so happy to finally have those done. Since they are the biggest part of Part 2, maybe I will have it done in the next couple of months. I am soooo slow at these things. Maybe one day I'll have more time. I completed Part A of the Silk and Metal GCC this last week. I think it looks pretty good. Now to do the other leaf that swoops downward next to it the same way. I still like the way goldwork goes fairly quickly. It's also good my husband has figured out how to make a temporary stand for me. I use two of his quick release clamps and clamp it to the table. Works really well. My husband was, as usual, taking my pictures on Thursday night when what happened? A cat jumped on his nice white sheet. If you see black hairs on my stitching, this is the culprit. Her name is Missy and she and her brother Tux are our foster kitties for the next couple of years. Very sweet, if pushy, cats. This is the kissing pillow I stitched this last week. It took about an hour and a half, and so makes a good little break project. I'm going to wait to make it into a pillow until I have a few more, either stitched by me or sent to me, and then make them all at once. This counts as number six on my ten project challenge, but I'm only going to count one of these instead of one each week. I think I can get Part 1 done this week. As you see, I made some progress there and put a second color on Part 2. I still really like the look of this, at least, and am definitely not getting bored. I'm almost done with the center medallion, finally, and since some of the colors were same in Part 2 and I had extra in my needle after finishing off the colors in Part 1, I started it. That's what the line going off from the medallion is. Hopefully, I'll be able to get the center part done next week. This weekend, though, I'll be going off to visit a friend. Who knows how much stitching I'll actually do? On the other hand, I'll be able to when I get back! New pictures will be taken tonight as I'll be leaving tomorrow afternoon.